Outside the TCRI building, reporter Jim McNaughton stands by as the National Guard prepare to force their way in. Suddenly, a beam of light (identical to the one that originally blasted from the roof of the building) arcs down from the sky and through TCRI’s roof. As the streets erupt in panic, McNaughton finds General Hedd, who reluctantly informs him that the National Guard are going to blast their way in immediately. Inside, at the transmat platform, the TCRI aliens (Utroms) stand ready in their robot bodies. The retro-search function proved successful in retrieving the Turtles, though it appears to have accidentally brought back Professor Honeycutt as well as a trio of angry Triceraton soldiers. The Utroms attempt to calm the Triceratons, but the ruthless dinos, realizing they’ve stumbled upon a working transmat device, strike at them. An all-out brawl between the Utroms and the Triceratons rages, with the Turtles and Professor Honeycutt caught in the middle! The Turtles kill one of the Triceratons, with the last two eventually rendered unconscious by stun-bolts from the Utroms. With the battle over, the Turtles stay on their guard for an attack from the Utroms, but the aliens call for peace. They apologize for any misunderstanding, having never intended to harm the Turtles. 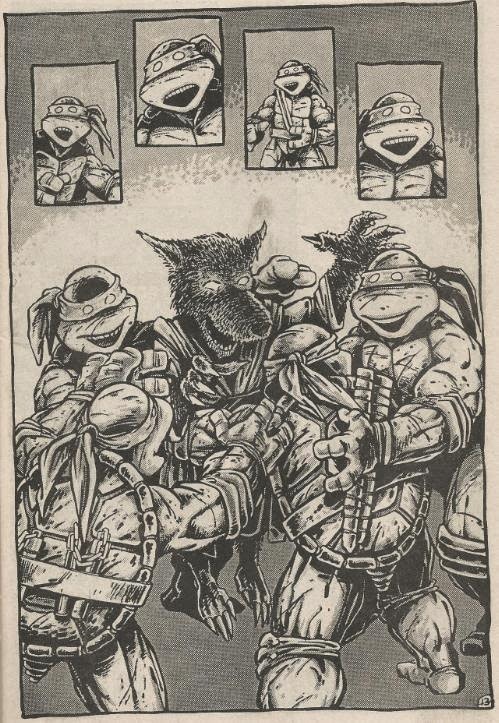 In fact, they decide now is the time to reunite the Turtles with the one they’ve been searching for all this time: Splinter! As the Turtles and Splinter share a heartfelt reunion, April tries to squeeze past the National Guard and get close to the TCRI building. She’s spotted by a guardsman who escorts her back to safety. Realizing there’s nothing she could have done anyway, April goes back to her van and drives away, whimpering that the Turtles are probably home, waiting for her. 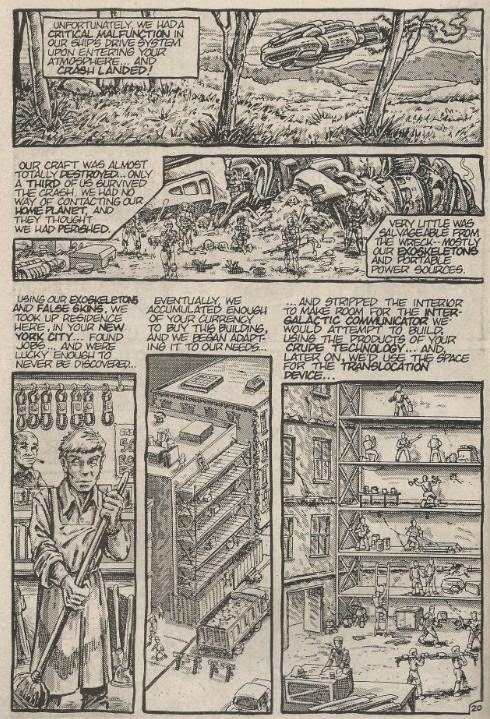 Inside, Professor Honeycutt helps the Utroms repair the transmat while Splinter calls his sons to rest while he tells them all that he has learned. His battle with the Mousers had wounded him and he escaped into the sewers where he was found by a TCRI patrol. The patrolmen, recognizing him as a mutant, took him back to headquarters for recuperation where he was placed in a healing tank. 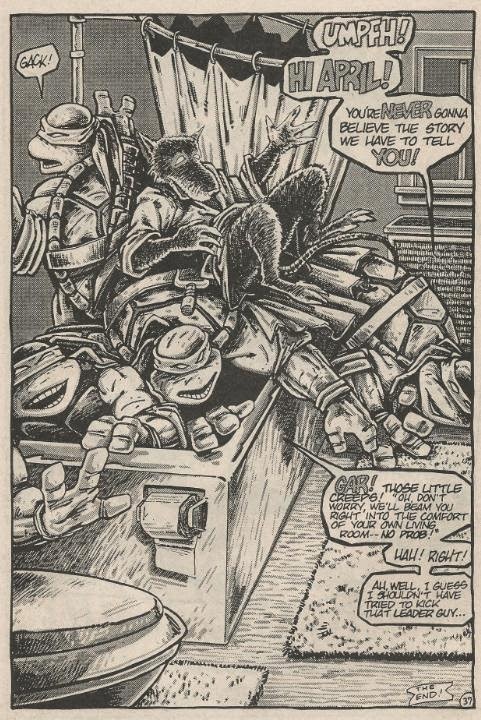 When the Turtles broke into TCRI headquarters and accidentally activated the transmat, the Utroms took Splinter out of suspended animation to inquire who and what the Turtles were, which is when they exchanged information. The Turtles are still confused, not sure exactly who or what the aliens are. The Utrom Commander then steps forward and tells their tale. The Utroms had originally come to Earth for study twenty-years ago, but a crash-landing left them stranded and without communication. Using their exoskeletons and false skins, the Utroms blended into New York society, working jobs until they could buy the TCRI building, where they began constructing their intergalactic communicator and translocation device. The alien then shocks the Turtles with this little tidbit: Exactly fifteen and a half years ago, while transporting the last of the salvage from the crash-site to their building, a blind man wandered in front of their truck, causing the driver to swerve. The act sent a canister flying from the truck’s bed, where it disappeared and they never managed to recover it. As it turns out, that very canister had struck a young boy’s glass terrarium containing four baby turtles before plunging down an open manhole. The turtles were found by a rat and I think you know the rest. The alien goes on to explain that even though they’d been in contact with their Homeworld for years now, they’ve remained on Earth, building a secret base and observing humanity for study. However, the unsuppressed flash from their transmat caused by the Turtles' hijinks has effectively blown their cover and they are now besieged by the National Guard. Outside, the Guard opens fire and blasts their way in. The Utroms are left with no choice but to do a rush repair job on the transmat, and that means inputting only one set of coordinates: Their Homeworld (which is bad news for the Turtles!). The National Guard makes it inside, but are quickly hit by guard robots with stun beams. This doesn’t stop them for long and the Utrom Commander orders an immediate evacuation. The Commander sets the self-destruct to cover-up their existence and oversees the last of his men as they enter the transmat beam. 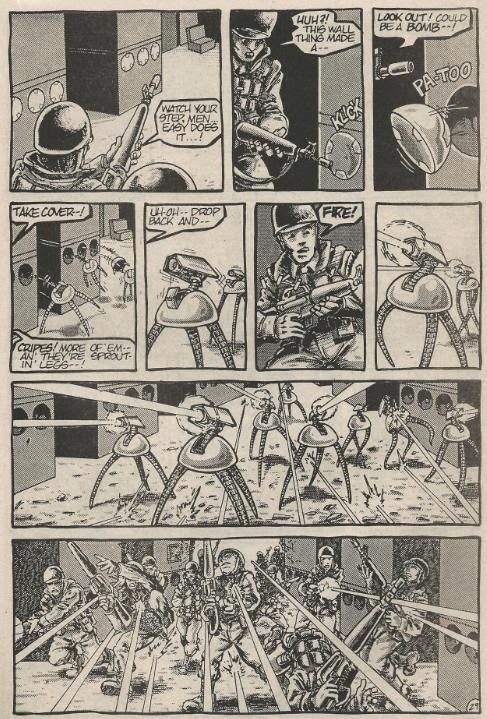 The Turtles aren’t too thrilled about having to go to the Utrom Homeworld, but with the Guard breaking down the door, they realize they have little choice and enter the transmat beam along with Splinter and Professor Honeycutt. The Guard make it into the chamber just in time to hear the five minute warning for the self destruct. At her apartment, April watches Jim McNaughton’s coverage of the “Three Day Crisis”. McNaughton interviews General Hedd, who informs him that all men made it out before the building’s collapse, but the true cause of the crisis remains a mystery. Suddenly, April is startled by a loud noise coming from her bathroom. She opens the door to find the Turtles and Splinter unceremoniously dumped into the bathtub by a transmat beam, cursing the Utroms and their terrible aim. *This story is continued from TMNT (Vol. 1) #6. The story continues in Michaelangelo (microseries) #1. *The Turtles will be invited back to the Utrom Homeworld by the Utroms and Professor Honeycutt to make amends in “Terror by Transmat!”. *One of the surviving Triceraton soldiers, Zog, will return in TMNT (Vol. 1) #19. *The other surviving Triceraton soldier, unnamed, will return in TMNT (Vol. 2) #11. *One of the Utrom guards in this issue will be identified as Klag and will later appear in Michelangelo: The Third Kind #1. *The Turtles' battle with the Mousers occured in TMNT (Vol. 1) #2, while Splinter’s battle with them was recounted in TMNT (Vol. 1) #3. The Turtles found him floating in a healing tank in TMNT (Vol. 1) #4. The origin of the Turtles was originally recounted in TMNT (Vol. 1) #1. *CHET ALERT: The boy who drops the Turtles down the manhole is alternately named Chester/Chet. Additionally, a building on page 32 bears the name “Chet”. “Chet” was in in-joke inserted into many TMNT comics by the Mirage staff because… they just liked the name! *The first printing of this issue contained two bonus stories, “You Had To Be There”, by Kevin Eastman and Richard Corben, and “Bade Biker & Orson”, by Jim Lawson, as well as a bonus pin-up by Jim Lawson. 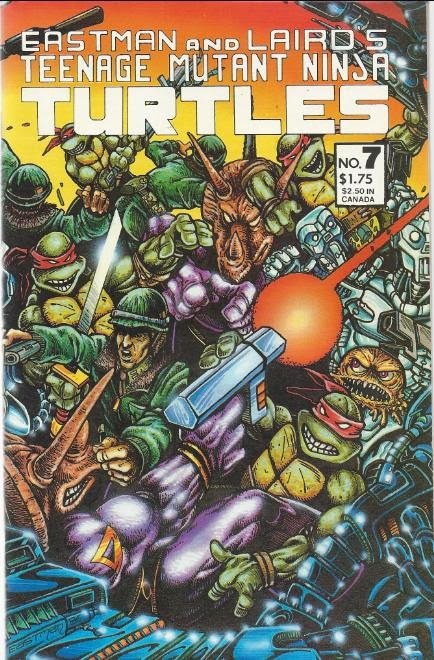 *A second printing of this issue was published in January, 1989, with a new cover by Peter Laird, Ryan Brown and Steve Lavigne, a bonus pin-up of Donatello meeting the X-Men's Wolverine by Hatten and Blacziunas, and an opening editorial by Laird announcing the first live-action TMNT film. “All is Revealed” is an accurate summation for this issue because damn, do they reveal quite a bit. As an epilogue to the space adventure arc, it actually feels rather appropriate, as it takes what may have been feeling like a completely random misadventure and tying it into the Turtles’ origin from issue #1, coming full circle. At the same time, it’s thirty-seven pages of dense text and exposition, but I suppose that couldn’t be helped. Still, with what scant plot that this issue contains that isn’t retrospective exposition, it actually sets up quite a bit of future storylines. We never see what became of the surviving Triceratons, as they disappear as soon as they're stunned and aren't shown being loaded into the transmat beam, but we’ll sure find out later down the line. The Turtles’ cooperative relationship with the Utroms is sparked with this story, as they lay down their weapons and come to an understanding. This element won’t become important until much further down the line, in TMNT Volume 4, but the seeds are sewn. Likewise, Professor Honeycutt very quickly and believably falls in with the Utroms; another key plot-point for TMNT Volume 4. And then there’s April. Not to retread my complaint from my review for the last issue, but once again she’s shown to be a dismal sadsack. Her actually going to the site of the TCRI crisis and attempting to slip past the guards was a nice gesture, but it falls apart thanks to an inner monologue berating herself for being so useless and then pathetically trying to convince herself that the Turtles are probably already back at her apartment, waiting for her. Mirage April is just a terrible, terrible female character that pales in comparison to every other incarnation from other Turtle media. How I loathe her. Anyhow, it’s hard to grade this issue since it’s so full of exposition and retreaded information, but the new scraps it delivers are all highly entertaining and important. 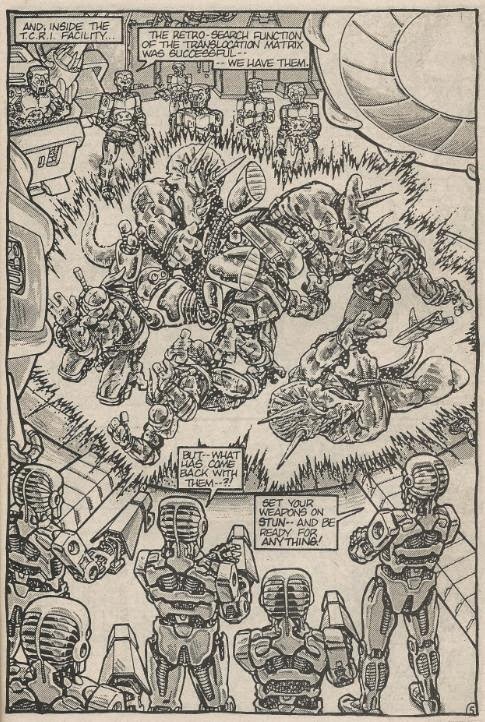 The three-way brawl between the Utroms, Turtles and Triceratons could have stood to be a bit longer, but what we got (particularly the one-page splash) was really cool. The constant barrage of “story time”? Not so much. In the end, TMNT #7 is an exercise in “something old, something new” and your enjoyment of it depends entirely on how patient you’re feeling at the time. but lets be honest here what else could she have done in this situation ? Waited until the last possible moment to mention those guards in the arcade game. Not a fan of your procrastination. But then again i am finally reading the original series. For the first time. TMNT was my childhood...LOL.